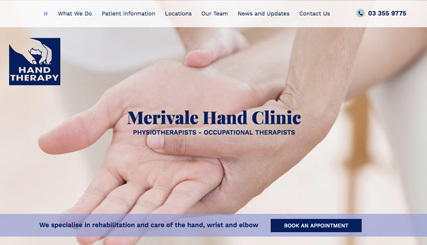 We custom designed a mobile friendly website for Merivale Hand Clinic. It was important that it be easy for users to quickly find information about the services they offer and for it to be simple to book appointments and locate their clinics. To build trust, the extensive skills, knowledge and experience of each of the hand therapists is highlighted within bios on the team page.